Nokia 5800 XpressMusic is no longer lurking behind corners as the curtains lifted today in London and Singapore on the first S60 full-touch device by Nokia. While most of the specs were given away well in advance, it's exciting to take a closer look at the touch OS. We had a taste of it back at the WMC in Barcelona and it tasted sweet. Two homescreen add-ons do sound intriguing. With the Media Bar music, media and online content are a fingertip away. The Contacts Bar provide enhanced touch-based handling of contacts, including setting favorites, logging calls, texts and recent communication. The touch-optimized handset comes complete with a stylus too, and for all who are about to frown at that, there's a plectrum-shaped alternative. The other controls are kept to the bare minimum. Below the massive touchscreen there's three-key combo along the lines of Pixon and Renoir, to name a few recent headliners. The home key (so long, Symbian key) is flanked by the Call and End knobs. For those who migh have missed the Nokia 5800 XpressMusic leaks, the first S60 touchscreen handset packs a 3.2" screen of the exciting widescreen resolution of 640 x 360 pixels. A 3.2 megapixel autofocus shooter and VGA video at 30 fps are the imaging assets. There's quad-band GSM support and 3G with HSDPA. Some of the other extras include: GPS, 3.5mm standard audio jack, TV-out and a microSD card slot. An ambitious music offering, Nokia 5800 XpressMusic will come with 8GB microSD card in the retail package and stereo surround speakers. To give you an idea of what the Nokia 5800 XpressMusic feels and looks like, we can also share several videos. This first one previews the device in short. Then the second one covers and explains the touch interface basics. And finally, the third one shows all the text input methods available on the Nokia 5800 XpressMusic. The debut of the Comes With Music service shared the spotlight with Nokia 5800 XpressMusic. 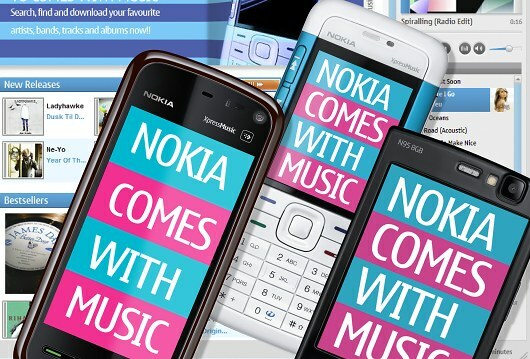 Comes With Music allows unlimited track downloads from the Nokia Music Store catalog for a period of one year and will be available across a number of handsets, including Nokia N95 8GB and Nokia 5310 XpressMusic. UK will be the first market to for Comes With Music, sales of enabled devices expected to start on October 16. Comes-With-Music enabled Nokia 5800 XpressMusic units will surface at the beginning of next year. Otherwise Nokia 5800 XpressMusic worldwide availability is planned for this quarter of 2008 at an estimated retail price of 279 EUR before taxes and subsidies. at&t im assuming, since it has a sim requirement at least that is what im hoping!!!! !